Huntersville, N.C. [April 11, 2011] — A dull utility blade on the job isn’t going to cut it – literally – and it creates frustration, unwanted delays, and loss of productivity for tradesmen. 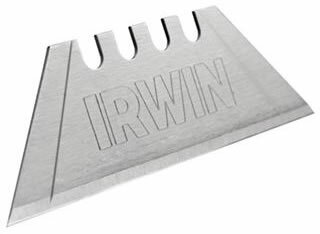 IRWIN® Tools announced today a new 4-Point Snap Blade that snaps on the score to create four cutting points, doubling the number of cuts made by standard carbon blades. Combining the toughness of a traditional utility blade with the versatility of a snap blade, the new IRWIN 4-Point Snap Blade gives tradesmen instant access to a sharp new point without the hassle of having to constantly change blades. In addition, the four notches on the blade’s top edge allow for full blade extension, regardless of how many of the tips have been snapped off. The IRWIN 4-Point Snap Blades are available at home centers, hardware stores and industrial tool distributors throughout the U.S. and Canada. The suggested retail prices of the 4-Point Snap Blade 5-pack, 10-pack, 50-pack and 100-pack are $1.29, $2.25, $8.99 and $14.99, respectively.